How to apply that information to your safety procedures. Here is an example of an arc flash label that we generated from our arc flash software (the one we use to do these studies for clients). You can see that there is a lot of information… some of it is fairly straightforward but other parts might sound Greek to you. Let’s just break down each part step by step and make sure you understand it all. This one seems pretty obvious. It’s a warning designed to grab your attention and make you aware of the hazards that exist. We won't spend a lot of time on this. In fact, that is all the time we will spend on it. The real meat of the label is the middle section that is split into two columns, so let's go there. Let’s look at the left-hand side first, titled Arc Flash Protection. 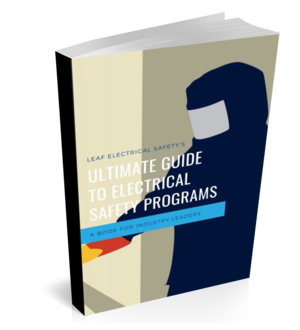 Not to be confused with the limited approach boundary (which it often is), the working distance is the assumed distance of an electrician’s torso from a perspective arc flash source. Typically, standing in front of a 600 volt MCC bucket your body is going to be about 18 inches away. The thing you need to remember is that the incident energy on the label is the energy expected at that specific working distance. The working distance is used in the calculation and the incident energy numbers will change if you work from a different distance. If you get closer the energy you are exposed to goes up, if you get further away it goes down. Distance is your friend when it comes to arc flash. This is the one you are probably most familiar with if you have been using arc flash labels at all. The incident energy is the amount of thermal energy that you will be exposed to during an arc flash event. The key here is to make sure your PPE (Face shield, balaclava, shirt, pants, gloves, boots) can withstand more than the posted incident energy level. Take a look at the tag on your PPE and make sure that the Arc Thermal Performance Value (ATPV) is greater than the incident energy level posted. At this distance, someone standing at the boundary wearing normal everyday clothes would get a second-degree burn if an arc flash occurred. Seems like a funny place to put a boundary. The reason you need this number is for helping to decide where to put your barricades to keep unqualified people away from the work area. You will also need to take into account the shock hazard limited approach boundary when choosing your barricade. I always say to pick the greater of the two and add a couple feet. In order to test the system (either to verify it’s de-energized or to troubleshoot) you are going to need to select the appropriate test instrument. The voltage level is the most important piece of information to help you select the right one. This is how shock hazards are measured… by voltage! If the label does not list the glove class (our example label does), then you need to use the voltage level to determine what rubber insulated gloves you need to wear. Once you have crossed the limited approach you are now in the territory of a potential shock hazard. This number signifies how close you can come to the equipment if you are an untrained or unqualified person. The limited approach boundary is a safe distance away from exposed live conductors. Use this number along with the arc flash boundary as discussed above to help set up your barricades. At this distance from an exposed conductor, the risk of arc over is increased. Have you ever watched those YouTube videos where something comes too close to a power line and the electricity looks like it jumps over to the object before it even gets there? Well, this is the same thing that can happen inside an MCC bucket or switchgear assembly except the moving object is you. Once your inside the restricted approach boundary you need to protect yourself. What’s important to remember here is your insulated rubber gloves. You just don’t go past the restricted approach boundary without them on. This number is directly correlated to the voltage level and just helps you choose the proper PPE. Check the label on your gloves to make sure you have the right ones on. Take a copy with you before you go! It’s a great idea to make sure the equipment information, date of the study, responsible engineer for the calculations, and any other pertinent information is listed at the bottom of the label to help maintain the system model when changes are made or updates are required. Hopefully, you now have a full understanding of the importance of each piece of information on an arc flash label and how it’s going to help you get the job done safely.